Prior to his injury in the fall of 1995, Rick enjoyed an active lifestyle as a professional rodeo cowboy. While traveling between rodeos, he was involved in an automobile accident that resulted in a life-altering spinal-cord injury. Physically weakened and struggling to cope with a damaged nervous system, Rick was eager to get started on the road to recovery. Having successfully worked his way back from previous injuries, he knew that the sooner he could get his feet under him, the better off he’d be. 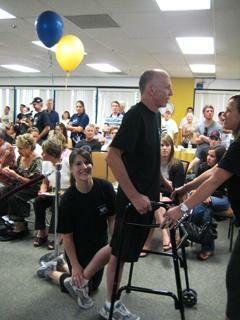 From the beginning, Rick has been committed to overcoming the many challenges posed by his injury. Training aggressively in the pursuit of improved fitness and function, he continues to push the limits of spinal-cord-injury recovery. Rick currently lives in Carlsbad, CA where he participates in an advanced training program at the Project Walk Spinal Cord Injury Recovery Center. Rick raises money through HelpHOPELive to help pay for the uninsured medical expenses and ongoing recovery therapies associated with his spinal-cord-injury. HelpHOPELive provides tax-deductibility and fiscal accountability, ensuring contributors that funds will be used for medical and recovery related expenses. Click on the “Donate Now” button above.